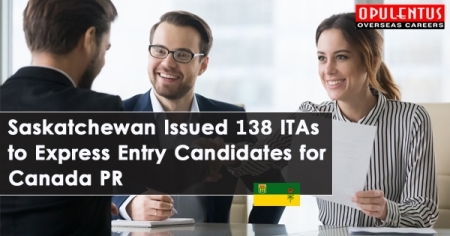 Saskatchewan announced 138 ITAs for a provincial nomination for Canada PR to Express Entry and profession In-Demand applicants in a round of selection conducted on Mar 6. Express Entry sub-category of Saskatchewan announced a total of 70 invitations and the remaining 68 invitations were issued by the sub-category Occupation In-Demand. Express Entry sub-category of Saskatchewan enables the province to choose skilled worker applicants with a profile in the Canadian Express Entry system. Express Entry aspirants with a provincial nomination get an extra 600 points toward their score of Comprehensive Ranking System, definitely assuring an invitation to apply for Canada PR. The sub-category of Occupation In-Demand is not associated with the Express Entry system. To be counted for a provincial nomination by Saskatchewan’s province sub-category of Express Entry or Occupation In-Demand, the initial step is to enroll an Expression of Interest profile with the Immigrant Nominee Program of Saskatchewan (SINP). Qualified candidates get a score depends on factors including their age, education, work experience, ability in English or French and links to Saskatchewan and are allowed into the pool for their particular sub-category of immigration. Applicants for both the Occupation In-Demand and Express Entry sub-categories should have experience in a high-skilled occupation on In-Demand Professions List of Saskatchewan. A fixed number of the high scored profiles are then encouraged to apply for a provincial nomination by the regular draws from the pool of applicants for both sub-categories. The least ranked applicant invited by the S.I.N.P’s Express Entry sub-category on Mar 6 had a score of 67 while the least-ranked applicant invited by the sub-category of In-Demand Occupation had a score of 81. The Mar 6 draw came less than 02 weeks after the S.I.N.P conducted an Express Entry concentrated draw on Feb 27 that announced 83 invitations. The S.I.N.P has now announced a sum of 515 invitations by its Express Entry sub-category and a sum of 302 invitations by its sub-category Occupation In-Demand in 2019.